The two volume Meta Given's cookbook I have belonged to an aunt who made many notes over the years. It is a cherished heirloom for the aunt who was Martha Stewart before Martha Stewart in everything from cooking to crafts, to creativity in entertaining. If chilling the pie crust and adding it to the hot oven in a Pyrex pie plate wouldn't it crack? I just baked this pie in a 9.5-inch glass pan using all half-and-half instead of cream and milk, and the pie turned out perfectly!! There are no cracks on the surface, and it took 45 minutes at 400? (although I'm sure I could have taken it out at the 40-minute mark). Hi Stokelyworks! 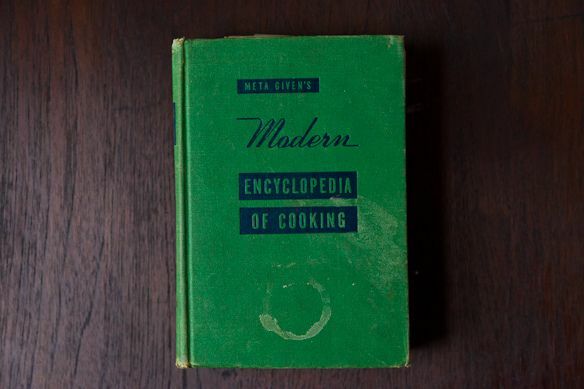 I have Meta Givens, 1953 copyright (previous copyright edition 1942) - The Modern Family Cookbook. 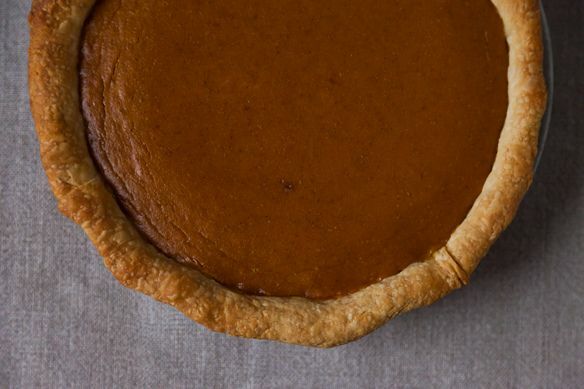 Has 2 versions of this pie, slightly different from each other, both slightly different from the one posted here on Food52. Sounds like Meta cooks similar in that I have "versions" of my recipes, have a feeling we all do :) ! Made this for the holidays and it lived up to its title - Genius Recipe. I don't even like pumpkin pie, but, loved this one. Thanks for sharing. This was wonderful, it looked great and tasted better. Thanks! Wonderful recipe! We baked this on Thanksgiving morning and had a perfectly iconic pumpkin for dessert. Tremendous success! The pumpkin pie lovers were silent with rapture and the non-lovers kept raving about how this pie converted them to the cause. This is now The Pumpkin Pie for winter holidays. I did use a glass plate but did not blind bake. The pie took 35 minutes in my measly electric oven, but that gave me more time to dress whichever child was to hand. The crust turned out perfectly cooked on the bottom, nether underdone nor burnt. Thrilling! I made this yesterday -- YUM. I was using a glass pie plate so I blind baked the crust for about 10 minutes as suggested. It was done in 25 minutes and was perfect! This pie sounds wonderful, and what a coincidence that I happen to have this cookbook shown in your article, (a hand-me-down), and my pie crust is mentioned, too! Thanks for the shout out Kristen. I'd like to add (for future purposes) that I have a Food52 link specifically for the crust mentioned, as well, there is a link with Dorie Greenspan making it. The links are below. The crust recipe is enough for 2 single crust pies or one double. Wow, the Holiday season is officially here, Happy Holidays to all! lapadia, i use your crust all the time. It is so delicious and flaky and it rolls lout like a dream. I used it for apple and pumpkin pies yesterday and it was wonderful. Thank you for a great recipe. Made this yesterday and it came out perfectly. Used a ceramic pie dish and after 25 minutes, it was perfectly set. Can't wait to eat it today! 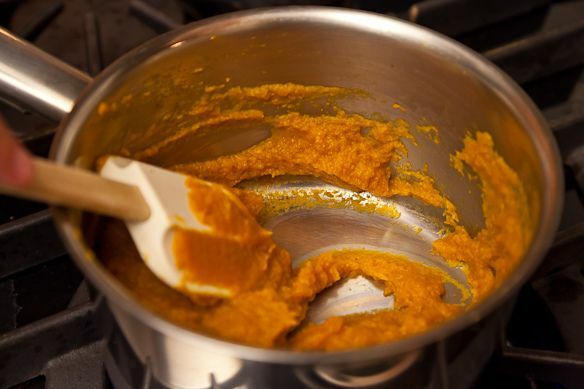 Will this recipe work as well if you use sweet potato canned mix? 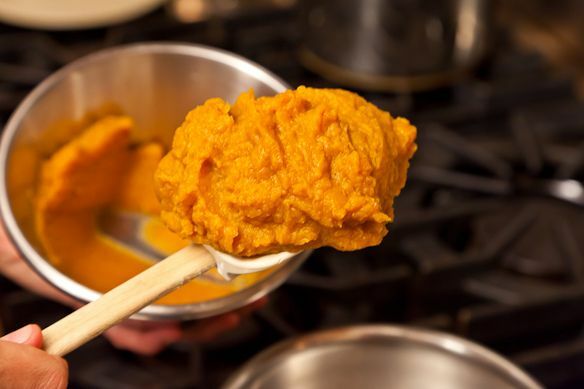 I've never used sweet potato canned mix, but if it looks like the orange puree in the photo above, it's probably fine. If it's already sweetened and spiced you should probably skip the sugar and spices in the recipe or only use them to taste. Could you use honey or maple syrup in place of all (or even some) of the sugar? So glad you posted this recipe! My go-to pumpkin pie for about 5 years has been from King Arthur. It's actually very similar to this recipe with the additions of brown sugar, nutmug, cloves, and a little black pepper. I've always loved it because of the cream (instead of evaporated milk). I'm going to combine it with this recipe because I LOVE the idea of caramelizing the pumpkin! Can't wait to try it with a heaping dollop of Genius whipped cream! I'll be using this technique to make some pumpkin scones that are on my to do list. 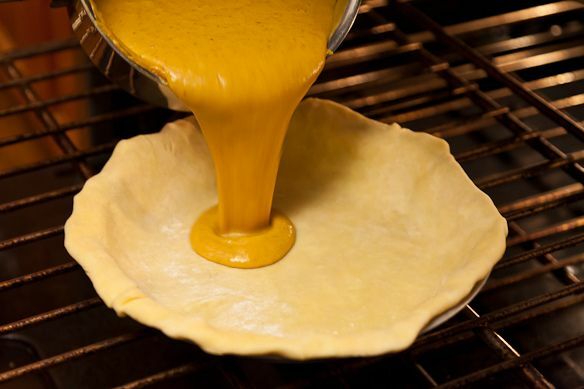 For Miche's question about refrigerating the pie if it's made the day before, yes, please refrigerate egg and milk-based dishes if they are not going to be consumed within a few hours of prep. Think of it this way - would you leave your creme caramel or quiche sitting around at room temperature for 18-24 hours before serving? Probably not. Safety first! 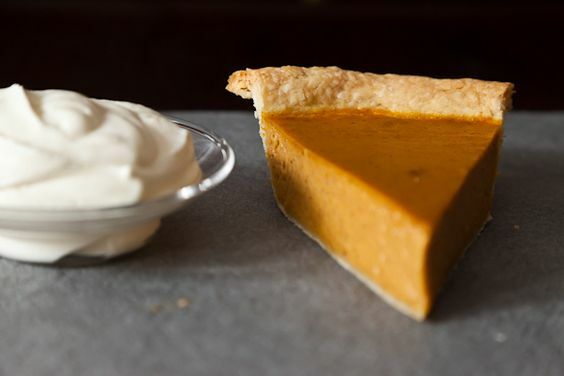 Query: Does pumpkin pie has to be refrigerated overnight if made on Wed? Hi Miche -- sorry we missed this question! I'd recommend refrigerating it overnight, but other commenters have said they just keep it in a cool part of the house and it's fine too. Looks great. Similar to our family recipe (i.e. ginger and no f***ing nutmeg, but made with 1/2 and 1/2 and brown sugar, and with the addition of a tad of apple cider and brandy.) I will definitely steal the idea of cooking down the fresh pumpkin as the only flaw in our recipe is that it tends to come out a little watery sometimes. Thanks. I just came across a recipe in Joanne Chang's Flour cookbook last night that also provides directions for cooking down the pumpkin as well...love this idea! I'm thinking about pairing it with a recipe for a pecan crust (found on the Whole Foods website (http://www.wholefoodsmarket.com/recipes/3095?utm_source=Responsys&utm_medium=email&utm_campaign=2011_11_21_Recipe). This is the first recipe for pumpkin pie I actually want to make!!!! Genius indeed!